^ a b c Cobbett, Richard (January 23, 2014). "Might and Magic X: Legacy review". PC Gamer. Future US. ^ a b "Open Dev - Devs talk about Deluxe Box & Release Date". 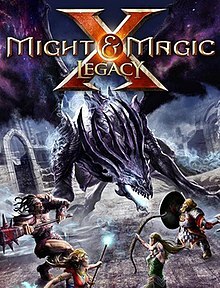 mightandmagicx-legacy.ubi.com. December 18, 2013. Retrieved December 25, 2013. ^ Fletcher, JC (March 21, 2013). "Might and Magic X Legacy to be shown at PAX East". joystiq.com. Retrieved April 3, 2013. ^ "Steam Community :: Group Announcements :: Might & Magic X - Legacy". 16 April 2014. Archived from the original on 5 March 2017. Retrieved 5 March 2017. ^ Falcon, Jonah. "Might & Magic X: Legacy officially announced". Strategy Informer. Retrieved 5 April 2013. ^ a b c "RPG Codex Interview: Might & Magic X - Legacy". RPG Codex. March 22, 2013. Retrieved 5 April 2013. ^ "THE SECOND OFFICIAL PATCH IS HERE". Ubisoft. Retrieved 18 November 2013. ^ "Celestial Heavens - Picture of the Day". celestialheavens.com. March 15, 2013. Retrieved April 6, 2013. ^ "Might & Magic X Legacy - Announcement Trailer [UK]". youtube.com. March 21, 2013. Retrieved April 6, 2013. ^ a b "Might & Magic X: Legacy for PC Reviews". Metacritic. CBS Interactive. Retrieved February 5, 2014. ^ a b Harman, Stace (January 23, 2014). "Might and Magic 10: Legacy review". Eurogamer. Eurogamer. ^ a b Tack, Daniel (January 23, 2014). "Might & Magic X: Legacy Review: The Game Of Yesterday, Today!". Game Informer. Game Informer. ^ a b Todd, Brett (January 24, 2014). "Might & Magic X: Legacy Review". GameSpot. Gamespot. ^ a b Kaiser, Rowan (January 24, 2014). "Might & Magic X: Legacy Review: One square at a time". Joystiq. Joystiq. Retrieved April 8, 2014. ^ Batchelor, Carl (2014-02-08). "Might & Magic X Legacy Review: A Legacy of Crushing Combat". Retrieved 2014-10-25.